Herausragend war hier Simon Bailey als Mr. Redburn, der einfach hinreißend, vorbildlich seinen Text artikulierte und seiner Rolle staunenswert viele Färbungen verlieh. Besser geht es nicht! Damit rückte er seinen Rollencharakter deutlich in den Mittelpunkt des Geschehens. Simon Bailey as Mr. Redburn was outstanding, whose enchanting performance, exemplary articulation and astounding amount of vocal colour put his character clearly in the centre of the action. The role could not be better sung! Aufgrund einer Erkältung sang Matthew Brook nur die Rezitative des schottischen Königs [...] Für seine Arien sprang im hohen Orchestergraben Simon Bailey von der Oper Frankfurt ein, der mit sonorem Baßbariton fast vom Blatt sang. Matthew Brook, suffering from a heavy cold, sang the King’s recitatives whilst Frankfurt-based Simon Bailey’s sonorous bass-baritone performed the arias from the score in the orchestra pit. Als die beiden Helden des Abends wurden vor der Vorstellung die beiden Interpreten des schottischen Königs angekündigt: während der stark erkältete Matthew Brook [...] für die kurzen Rezitative den erforderlichen Nachdruck mobilisiert, stattet Simon Bailey die kurzfristigst gelernten drei Arien aus dem Orchestergraben mit soviel Bass-Grundierung und sicherem Vortrag aus, dass kaum ein Bruch zwischen ihm und dem parallel dazu mimenden Kollegen entsteht. Kompliment! Before curtain-up an announcement was made that the role of the King of Scotland was to be performed that evening by two heroes; Matthew Brook, due to a cold, would perform the recitatives, whilst Simon Bailey, having prepared the three arias at short notice, would sing from the orchestra pit, his rock-solid bass voice and confident performance ensuring a near-seamless combination. Bravo! Mit großer, wunderbar tragender und warmer Stimme sang Simon Bailey seine Passagen. On a stage packed with riveting characterisations and eye-catching cameos...Simon Bailey musters huge emotions in Shaklovity’s anguished lament for Russia’s woes. Robert Hayward’s Ivan is the big vocal presence, but it is the dignified authority of Miklós Sebestyén’s performance as the believers’ leader, Dosifei, that helps carry the evening, and Simon Bailey is similarly imposing as Shaklovity. Tomáš Hanus conducts with passion. Outstanding among a consistently fine ensemble are....especially the self-accusing murderers, Mark Le Brocq’s Luka Kuzmich, Alan Oke’s Skuratov and Simon Bailey’s Shishkov. Simon Bailey, in the role of Shiskov, was a commanding presence both physically and vocally. From strident folk chorus to impassioned monologue via madcap pantomime, with a myriad characterisations the singers are stupendous....especially Simon Bailey (Shishkov) – and [the] Welsh National Opera chorus – deserve particular praise, coming hotfoot from Khovanshchina, the opera’s blood-brother in this Russian-themed season. Simon Bailey as the embittered Shiskov dominates the final act and suffers an appalling revelation at the close. Unlike the other two operas in Pountney’s Russian revolution-themed season, this was sung in English, every syllable articulated to perfection...every singer here pushes themselves to the utmost in portrayals of great force, notably Alan Oke’s Skuratov, Mark Le Brocq’s Luka Kuzmich and Simon Bailey’s Shishkov. Conductor Øyvind Gimse led the talented line-up of string ensemble Trondheim Soloists, the BBC singers and soloists soprano Ann-Helen Moen and bass Simon Bailey in this evocative performance. The historic setting of the cathedral, and its magnificent acoustics, heightened the dramatic atmosphere. Moen and Bailey, as the parents of the little boy who drowns, sang beautifully and with chilling conviction. There was a starkness to the dark lyricism of their lines set against the wispy strings with their shimmering harmonics. The BBC Singers took full advantage of the cathedral’s acoustics, revelling in Nicholson’s quirky harmonies, and while it is true that bass Simon Bailey and soprano Ann-Helen Moen seemed more concerned with drama than lyricism, the approach worked. Indeed, when Bailey sang "Have you seen a little boy? ", his fear of having lost his son was clearly palpable. Der dümmliche und zugleich urkomisch-schlaumeierische Preisboxer ist eine Paraderolle für Simon Bailey! Simon Bailey markierte dazwischen die tumbe Stärke des Boxers Adam Ochsenschwanz mit deftigem gespannten Arm- wie Stimmmuskeln, ein heftiger Knalleffekt beendet die Klamotte vom Schwergewicht. ...den Meisterboxer Adam Ochsenschwanz, gekonnt urkomisch Simon Bailey, wieder als Gast nach Frankfurt zurückkehrte. Überdreht und zugespitzt sind die Figuren beim Einakter Schwergewicht. Hier bringt vor allem Simon Bailey groß raus, als vor Kraft strotzender Boxer Adam Ochsenschwanz. Lothar Koenigs leitete die Wiederaufnahme mit ausreichend Rücksicht auf die Sänger […] Von der Rücksichtnahme profitiert vor allem Simon Bailey als Jochanaan(s Stimme). Nicht dass es dem Engländer an Stimme fehlen würde – weiß Gott nicht – aber selten konnte man diesen Part so salbungsvoll, kräftig, aber eben auch wortdeutlich vernehmen. Herrlich! Lothar Koenigs conducted the revival with sufficient consideration for the singers [...] Simon Bailey above all benefited as the voice of Jochanaan: not that the Englishman lacks voice, Heaven forbid, but because seldom has one heard this role so sensitively, powerfully but also so vividly performed. Tremendous! Beim Jochanaan des Simon Bailey triumphiert die hymnische Feierlichkeit, begleitet von der einfachen und zur Liedhaftigkeit neigenden Melodik und klaren Harmonik. Simon Baileys Pilatus klingt durchweg die autoritäre Nüchternheit eines römischen Statthalters mit, der mit Prozess, Urteil und Exekution wenig zu tun haben will. Und in den Arien erweist sich Bailey als außerordentlich prägnant und sicher. Throughout, Simon Bailey´s Pilate is an authoritarian, sober Roman figure, who wants little to do with the process of trial, judgment, and execution. In the arias, Bailey proves to be extraordinarily incisive and secure. Simon Bailey, rafle la mise en cochant toutes les cases requises par le double rôle de Satan et de Nicanor, à commencer par cette qualité de prononciation qui fait si cruellement défaut à ses partenaires. Savoir aussi bien insinuer que proférer est indispensable pour donner à comprendre la puissance de l'esprit du mal. Manipulateur lubrique et pervers, Simon Bailey ajoute à la science du texte celle de la couleur, nécessaire pour faire de la scène des enfers mieux qu'une mascarade romantique, un tableau terrifiant qu'une mise en scène moins scolaire aurait pu rendre plus impressionnant encore. Simon Bailey is the evening's winner, ticking all the requisite boxes as Satan and Nicanor, starting with the kind of quality [French] pronunciation so desperately lacking in his colleagues. [Bailey's approach] is to use insinuation rather than threats to give power to the evil spirit. A lewd and perverse manipulator, Simon Bailey adds to the science of of the text the necessary colour to transform the scene from a romantic masquerade of the underworld into a terrifying tableau, that a less scholastic staging could have made yet more impressive. Simon Bailey verleiht nicht nur Olympias Bruder diabolische Züge, sondern überzeugt auch als Satan mit dämonischer Bühnenpräsenz. Dabei stattet er beide Partien mit einem dunklen und bedrohlich wirkenden Bass-Bariton aus. Regelrecht Angst einflößend gelingt ihm das Duett mit Busuioc im zweiten Akt, in dem er die junge Christin zu verführen versucht. Wenn er später als erstarkter Satan aus dem Bühnenboden wieder aufsteigt, gibt es für ihn darstellerisch überhaupt kein Halten mehr. Mit genau auf die Musik abgestimmten rhythmischen Schlägen befreit er im ersten Bild des vierten Aktes mit einer gewaltigen Axt die Christen von ihren Fesseln und ruft zur Revolte auf. Simon Bailey [as Nicanor] lends Olympia's brother diabolical traits, but also convinces as Satan with a demonic stage presence. He performs both roles with a dark and menacing bass-baritone. The duet [with Lilia] in the second act is profoundly terrifying, in which he tries to seduce the young Christian. When he later returns as Satan from the stage floor there is no stopping his performance. With rhythmic strokes of a mighty axe he frees the enslaved Christians from their chains, and calls them to revolt. Simon Bailey did a fine job, firstly as the villainous proconsul, Nicanor, and then as Satan, particularly in Act IV as he frees the slaves from their fetters singing the technically fiendish chromatic scales to great effect. Der Prokonsul Nicanor ist der Fiesling in dieser Oper. Simon Bailey gibt diesem Macho unverkennbares Profil in seinen heftigem Liebesbegehren und färbt seinen gut fokussierten Bassbariton noch um einigen Grade dämonischer, wenn er zu Satan mutiert ist. in the violent love scenes and colours his well-focussed bass baritone a few grades darker after the mutation to Satan. It is not often to have a Gunther so vocally strong and assertive as Simon Bailey. Als Elias kam Simon Bailey die tragende Rolle zu, und diese Aufgabe erfüllte er mit stimmlicher Brillanz und Beweglichkeit. Klar, prägnant und kraftvoll ließ er den zürnenden Prophet wüten, um später in der Bravourarie „Es ist genug“! mit unendlich viel Zartgefühl einen von Schmerz und Resignation gezeichneten Mann zu zeichnen. 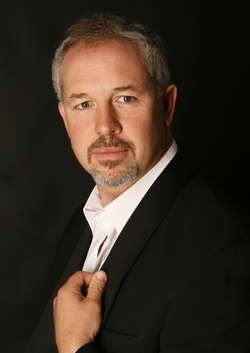 Particularly noteworthy is the internationally sought-after bass-baritone Simon Bailey, who has appeared in the opera houses of Frankfurt, Vienna and Glyndebourne, and at La Scala, Milan, who shone in the role of the jealous Prophet Elijah with a sovereign, gripping interpretation. As the protagonist he fulfilled this task with vocal brilliance and agility. He clearly, concisely and powerfully let the angry prophet rage in ´Is not his word like a fire´, before portaying the prophet´s pain and resignation in the aria "It is enough"! with infinite tenderness. Elias (gesungen von Simon Bailey) macht denn auch von Anfang an klar, dass der Gott Israels für die Dürre verantwortlich ist und sie auch beheben kann. Das dramatische Geschehen lockte Bailey auch zu schauspielerischen Gesten und Wendungen, die der Interpretation des Werkes gut taten. The remainder of the cast was never less than serviceable, with a few real standout performances. The best of these was Simon Bailey as Kaspar. The dark tone of his voice is ideal for the part, and although he has a tendency to ham up the menacing stage presence, especially the evil laugh, it all served to inject sorely needed drama to the proceedings. The Wolf’s Glen scene was the highlight of the performance, partly because Pountney finally found a way to make his minimalist conception deliver, but also because it was dominated by Bailey’s Kaspar and [Sir John] Tomlinson’s Samiel. Simon Bailey stood out as an intense and imposing Kaspar, every consonant and sibilant telling – his voice has a striking sinewy quality allowing him to present a more complex and chilling character than the usual inky-black bass-baritones, and he carried ‘Wolf’s Glen’ from a dramatic perspective and with intensity. ...I should imagine they could hear Simon Bailey’s quite superb Kaspar on the other side of the river. I’d never heard him before last year, when he sang a gloriously full-bodied and secure Leporello at Covent Garden at the end of a run where his predecessor in the role had made no impression whatsoever (Alex Exposito, grisly). He seems to have made his career primarily in Frankfurt thus far; but it’s high time he – like [Christopher] Ventris – came home (ever assuming he wants to, of course) not least because he has the dramatic chops to be as frightening in this as he was funny in the Mozart, and can sing properly too. More, please. Simon Bailey was [Max´s] nemesis Kaspar and with an OTT demonic laugh he would have chewed the scenery had there been any scenery to chew. In the devilish goings-on of the Wolf’s Glen he was at his best and brought a much needed dramatic frisson to the proceedings. The outstanding male singing and characterisation came from Simon Bailey in the role of Kaspar. This had a lived-in quality to it from a singer who was completely comfortable with all its demands. The black quality to his voice, Iago-like in its insinuation, was always at the service of the music, and in his key Act I aria the absolute steadiness in his deepest register when he reached “Nichts kann dich retten vom tiefen Fall” was most impressive. Though written as a pantomime villain, Simon Bailey’s Kaspar was as magnetic as he was bad, the bruised outsider in a naive society. Playing the straight(ish) man, Simon Bailey´s Siroco anchors the ensembles with generous resonance. Simon Bailey, as Siroco, demonstrated a clear dramatic focus and a vocal directness to match. Nachhaltigen Eindruck hinterließ Simon Bailey mit seinem mühelos den Saal-füllenden Bassbariton und ausgezeichneter Textverständlichkeit. Simon Bailey left a lasting impression, his bass-baritone effortlessly filling the hall and his diction excellent. Simon Bailey (Leporello)[is a] wonderful actor , the bass-baritone has a phenomenally clear vocal emission and perfect diction. At ease on stage, he relishes cultivating humorous situations. Pushing the limits of his character to caricature, Simon Bailey´s portrayal of the servant is hysterically funny... And, although his "Catalogue aria" remains a moment of vocal and theatrical joy, the scene where he assumes the role of Don Giovanni to seduce Donna Elvira is a small masterpiece of buffoonery . His theatricality is so overwhelming that we almost forget what an admirable singer he is. Une impression qui se confirme avec l’entrée du Simon Bailey (Leporello). Formidable acteur, le baryton-basse possède une clarté d’émission phénoménale et une diction parfaite. A l’aise en scène, il cultive l’humour des situations avec bonheur. Poussant son personnage aux limites de la caricature, Simon Bailey campe un serviteur désopilant. Si son «air du Catalogue» reste un moment de pur bonheur vocal et théâtral, la scène où il prend le rôle de Don Giovanni pour séduire Donna Elvira est un petit chef d’œuvre de bouffonnerie. Sa théâtralité est d’une telle évidence qu’on en oublie presque l’admirable chanteur. Am ´theatralistichen´ gab sich Simon Bailey in der Titelpartie, ein fundamentales Portrait mit reicher Charakteristik. Mit einem schark deklamierenden Bariton Simon Bailey (Saul) und dem agilen Countertenor David Allsopp (David) standen sich tyrannischer Herrscher und messianische Lichtgestalt profilstark gegenüber. Besonders hervorzuheben ist der Brite Simon Bailey als Christus, der seinen Riesenpart mit viel Ausdruck und stimmlicher Brillanz bei klarer Verständlichkeit meistert. An impressive highlight was the British singer Simon Bailey as Christus, who mastered the demands of his huge role with vocal brilliance, clear diction. Als Gurnemanz war Simon Bailey zu hören. Seine Rolleninterpretation gelang geradezu perfekt. Sonor und ausladend tönend, jeder Nuance nachspürend mit sichtbarer großer Beteiligung war er das sängerische Zentrum dieses Abends. Großer Applaus für diese letzte Premiere der Saison im Frankfurter Opernhaus. Denn die Neuproduktion...wirkt dank der Sänger wie auch des Frankfurter Opern- und Museumsorchesters enorm frisch und höchst lebendig...Simon Bailey taucht immer wieder mit verführerisch geschmeidigem Bassbariton als dämonischer Nick Shadow auf. Simon Baileys Nick Shadow servierte das Teuflisch-Verführerische mit der Eleganz eines Salon-spielers: Nichts Böses ist an ihm. Simon Bailey als Nick Shadow betonte mehr die doppelgängerische Kameraderie als die höllische Schwärze, ein neuerlicher Höhepunkt seiner Darstellungskunst. [Als Nick Shadow] gefiel Bariton Simon Bailey in Stimme und alertem Spiel. Schön und elegant darf auch der dämonische Verführer Nick Shadow in Gestalt von Bassbariton Simon Bailey klingen, das Kräftig-Grelle bleibt, auch optisch, der „Türken-Baba“ von Paula Murrihy vorbehalten. Doch warum erliegt Tom der Versuchung? Klar doch, der freundliche Verführer Nick Shadow, hinter dem sich der Satan maskiert, bringt ihn auf die schiefe Bahn. Der Bariton von Simon Bailey meidet mephistophelische Bosheit, denn die Regie gibt ihm durchaus freundschaftliche Züge. Irgendwie ein netter Kerl, der sich am Ende selbst ins Grab stürzt, weil er seinem Opfer Tom noch eine letzte Chance im Kartenspiel gibt. Simon Bailey ist der genuine Engländer für die Rolle des Nick Shadow. Sein warmer, distinguierter gut sitzender Bariton deklamiert auch so nachhaltig, dass man errät: er hat die Sache im Griff. Womit wir beim Teufel wären. Bariton Simon Bailey, wie [Brenda] Rae ein langjähriges Frankfurter Ensemblemitglied, spielt und singt einen unwiderstehlichen Verführer, metallische Kraft in der Stimme, allzeit ein diabolisches Grinsen im Gesicht – Brad Pitt kann einpacken. Als herrlicher Kontrapunkt zu all dieser Erotik preist Haushofmeister Gelone von Anfang an den Wein als wahre Lebensgrundlage und liefert eine herrliche Saufnummern nach der anderen – und dabei belebt Simon Bailey wie nebenbei eine musikhistorische Besonderheit: Im barocken Ziergesang gab es den „basso alla batarda“, der je nach Situation aus dem Brustregister über drei Oktaven ins Falsett wechseln konnte – jetzt staunenswert zu erleben. Simon Bailey ist als Gelone im besoffenen Zustand ein Bariton, der nüchtern wunderbar falsettieren kann. Den stets betrunkenen Gelone spielt und singt mit hoher Bühnenpräsenz Simon Bailey, der virtuos die Stimmlagen wechselt. Mehr noch muß man Simon Bailey dafür rühmen, wie er dem von Dämonen der Vergangenheit gequälten Blaubart mit vollem Körpereinsatz glaubwürdig selbst in epileptischen Zuckungen eine nachgrade schmerzhafte Präsenz verleiht.... und wie es Simon Bailey gelingt, mit seinem doch eigentlich kultivierten und runden Bariton die gebrochene Gestalt des Blaubart zu zeichnen! Simon Bailey portrays the broken figure of Bluebeard credibly... he renders the tormented demons of Bluebeard´s past convincingly, his staged epileptic convultions are a painful presence, and he deserves admiration for his constant physical commitment and his cultivated, well-rounded bass-baritone. Simon Bailey setzte als Blaubart seinen sehr kultivierten, lyrischen Baßbariton dagegen. Hier ging Finesse vor Kraft; das Orchester hätte ihn manchmal mehr schonen können. Sein Spiel war geradezu sensationell bis zu den artistischen Einlagen im Gerangel mit Judith. Eine großartige Stunde Leidenschaft hoch konzentriert! Simon Bailey hingegen sang den Leporello mit frei fließendem Bassbariton, ausgesprochen nuanciertund stets mit auf dem Atem liegender Stimme. Simon Bailey is an engaging Leporello, nimble of voice and action. Der Leporello von Simon Bailey erhält gerade in seiner federnd leicht gesungenen Registerarie eine ungewöhnliche psychologische Deutung, wenn er statt Hohn und Spott zunehmend Mitleid für Donna Elvira empfindet und sich angewidert von seinem Herrn distanziert. The two male soloists were new to me but both proved to be ideal choices. The tenor has the most to do and at every turn Alan Oke’s singing gave great pleasure....Simon Bailey also made a very positive impression. He told the story of the worldly lover of hunting, ‘The Monk’, with evident relish – again, the orchestra was sometimes too heavy in this movement. Even more enjoyable – and even finer as a piece of singing – was ‘The Sergeant of The Law. The Franklin’ (movement 8). Firstly, Bailey evoked the full majesty of the law. Here he deployed splendid tone with every note firm and true and, like his tenor colleague, he delivered the words with great clarity. Then he articulated crisply – as did the orchestra – the faster music in which Dyson depict the prosperous Franklin and his enjoyment of the pleasures of the table. In 1829, one year after the early death of composer Franz Schubert, music publisher Tobias Haslinger collected the composer's last works of song, including the settings of seven pieces by the poet and music critic Ludwig Rellstab, six poems by Heinrich Heine, plus a fourteenth song called "Die Taubenpost", into what we now know as the song cycle "Schwanengesang". Bass-baritone Simon Bailey, a member of the Ensemble of the Oper Frankfurt, succeeded in presenting an impressive recital,...(on Friday evening in the large hall of the Peter-Cornelius Conservatory)...working in very finely nuanced ways in order to bring to life all facets of this song cycle, facets which lend Schubert's songs their typical colors; the fluctuations/uncertainties between hope and doubt, death and love, the abyss and the peak. Bailey´s presentation is enthralling, capturing the audience from the first note, and providing many moments that make us forget about the outside world. Baileys rich voice lyrically and vibrantly permeates the hall in cooperation with his congenial partner at the piano, Uwe Zeutzheim, director of a piano class at the PCC. Together, they sailed around some tricky cliffs, successfully navigating, almost without exception, the sometimes very difficult dynamic and tempo changes, though on a few occasions one could have done with a bit less piano. The often-played "Ständchen" is positioned as an early highpoint of the piece, but Bailey continues through the following songs, winging his way, endlessly, from one vocal climax to the next. In the process, he remained reserved with his gestures. Bailey is in no need of following the lead of other singers who have made mannered gestures a part of their chamber music performance. Bailey lets the music and his own prowess speak for themselves. On this evening, during the setting of the Heine songs, both the song cycle and Bailey's singing reached the absolute climax. In Franz Schubert and his Songs, the great Dietrich Fischer-Dieskau, a proven Schubert expert, describes the Heine songs as "purest masterpiece". What begins with "Abschied" and ends with "Der Doppelgänger" is the art of song at the highest level. Bailey's dynamic, and seemingly effortless performance leads one to dream, and the auditorium seems to be more than voluntarily, and in the most positive sense, paralysed. There is a breathless calm/silence in the short breaks between the individual songs. Schubert never composed the cycle in this form. It is, rather, a collection of unconnected titles from which the final title, "Die Taubenpost", seems particularly noticeable as a foreign object. Haslinger was superstitious and wanted to add this song so that the number of songs in "Schwanengesang" would not be the unlucky 13. In Bailey's consistently high-class presentation, however, this 'foreign object' also seems to be, first of all, a bewilderingly strong, syncopated return from a dream world into reality in order to argue its own right to exist. After the interval Bailey continued his exceptional performance seamlessly with Wolf's "Michelangelo-Gesängen" and the short cycle by Johannes Brahms entitled "Vier ernste Gesänge". In the low register of Wolf's "Wohl denk ich oft" and "Fühlt meine Seele", Bailey's voice penetrates the listener's being so completely that your own diaphragm becomes a resonance chamber/body for his voice. Though these songs also reveal a high level of compositional skill, one is left wishing that Bailey would have sung Schubert's "Schwanengesang" a second time. In a reassessment of Schubert, Fischer-Dieskau wrote, "And if he wants to sing of love, it changes into pain; though if he wants to sing of nothing but pain, it becomes love." The foundation of this statement could also be applied to this exceptional evening. Pain: not just that the hall was only half full at best, but also that it was only half full for an artist of such international calibre when the tickets were free; and that the evening, in spite of being two hours long, ended much too soon. And what about love? Anyone who was in attendance and was not able to discover, or re-discover, their love for Schubert's songs is probably beyond help. Johannes Brahms and Hugo Wolf also composed earnest final song cycles that hinted at a premonition of death. Simon Bailey, Bass-baritone in the ensemble of the Oper Frankfurt, and Uwe Zeutzheim, Pianist and instructor at the Peter Cornelius Conservatory, combined these three romantic final works into an emotionally consolidated/dense recital program. "Liebesbotschaft", the first song in Schubert's "Schwanengesang", starts to lead one in the wrong direction. It is certainly full of desire/longing/yearning/nostalgia, but the melody comes across as blithe, jaunty and sweet. Bass-baritone Simon Bailey sends it through the hall with a pleasant, whispering effortlessness. There is nothing in this presentation that would hint at the dark and desolate mood that awaits in the following song, "Kriegers Ahnung". A heavy funeral march leads us into the nightly, sleep-robbing brooding over the distant love. Uwe Zeutzheim communicates the broken-hearted man's internal shaking and trembling through his vivid playing of the piano. Simon Bailey handles the text very sensitively and, where it is right and fitting, illustrates the text with a touch of acting. Take the forte outcry of "Atlas" for example, where Bailey comments on by employing a fixed introspective stare. Hope flickers through in the seven songs from Rellstab's poems, but it is outweighed by the melancholy in the settings of Heine's works. In "Ihr Bild", Bailey interprets the loss of the lover with deathly sadness, evokes latent dramatics in "Am Meer", and permeates "Doppelgänger" with deep-seated pain. Hugo Wolf's Michelangelo Songs lead further into the shallows of pain and death. The recital comes to a peak in Johannes Brahms's "Vier ernsten Gesängen". It is a moving Requiem which moves between feelings of bitterness and furious anger. Bailey plays out his musical capacities with virtuosity. With his gentle voice which goes straight to your heart, Bailey is an empathetic storyteller who maintains a genial distance. A haunting evening which rightly deserved the Bravos it received.